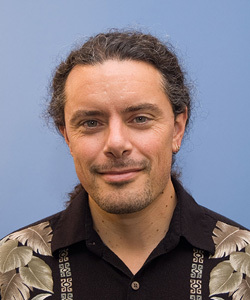 The University of California, Santa Cruz, has named Michael Mateas, associate professor of computer science in the Jack Baskin School of Engineering, as the first holder of the MacArthur Foundation Chair at UCSC. The endowed chair provides $80,000 annually for a five-year term to support Mateas's teaching, research, and public service activities. An expert on computational media and computer game design, Mateas wants to radically expand the expressive power of "serious games." The term "serious games" refers to the application of computer game technologies in areas such as education, training, and public policy. Examples include games to train firefighters for emergency rescue situations or to explore the environmental and public policy implications of different carbon offset schemes. But Mateas sees even broader potential for games as an expressive medium. He wants to make it easier for people to create computer games involving realistic social interactions between characters, building on his pioneering work as codeveloper of the interactive drama Façade, considered the first of its kind. "Michael's proposal to expand the power and reach of serious games is both ambitious and well-focused," said Arthur Ramirez, dean of the Baskin School of Engineering. "The proposed research will strengthen the intellectual foundation for our computer game design program, one of the campus's fastest growing undergraduate majors." According to Mateas, all of the currently available computer games, from SimCity to Guitar Hero, represent only a small fraction of the potential applications for game technologies. He prefers the term "computational media" to refer to the full range of potential technologies and experiences that he and his colleagues in the Expressive Intelligence Studio at UCSC are beginning to explore. "We're at a threshold, just beginning to create a medium that in many ways is as broad as writing," Mateas said. "Anything you can imagine conveying in writing or film, you can potentially do in computational media in a way that makes it amenable to a level of exploration and reflection that is not possible in those other media." The essence of computer games as a medium is play, he said. The technology presents the player with a series of challenges and opportunities for exploration that allow for a deeply engaged interaction with the underlying computational model or simulation. But today's games only simulate effectively a few types of systems, such as movement, combat, and resource allocation. Serious games require playable models of domains such as social interactions or public policy challenges. Mateas is working to create an intelligent authoring tool that will make it easier for people without a high level of technical expertise to create interactive dramas like Façade. "I want to enable everyday people to create games about topics that are important to them without having to hire a big team of experts," Mateas said. The difficulty and expense of developing a new game from scratch, which typically involves a large interdisciplinary team of game developers, is a major challenge that limits the creation of serious games. Mateas said he often encounters people who have great ideas for games, but they have no idea how much work would be required to create one. At one recent conference, for example, he met an emergency-room nurse who saw how useful a game like Façade could be for training doctors and nurses to deal with stressful situations in an emergency room. "I had to say it would take a big team of experts and a couple of years of work to do that," Mateas said. "Nowadays, games are made by brute force--every object, every challenge you face in the game has been manually placed there by a designer, so only people with a lot of resources are able to do it. A tool that would enable the computer to help you generate content could put the expressive power of computational media in the hands of more people." In addition to his interest in interactive drama, Mateas is working on the development of emergency response training games. He has done preliminary work on a training game for rescue situations in collapsed buildings, working in collaboration with a team at NASA Ames Research Center that offers one of the few available training classes for this type of rescue operation. Relatively few firefighters are able to take the training class each year, so a computer game would enable them to practice their skills more often. The focus of Mateas's research has been on developing software that will automatically generate new training scenarios. "It's an instance of pushing content generation into the machine," he said. "The scenarios have to be close enough to what firefighters would actually face so that they can learn something, but also there have to be many different scenarios so that they can keep learning from playing the game. There's no practical way to do that without automatic generation." Mateas said he is particularly excited about using the MacArthur Foundation Chair as a platform for engaging public interest and spreading his ideas about the potential for computational media. "What excites me about games is their potential as a new way to communicate and to reflect on the human condition," he said. "Having the MacArthur Chair helps to legitimize this work and sends a clear message of support for the creation of this new discipline of computational media." With a growing number of faculty and graduate students conducting research in the area of computational media, UCSC is at the forefront of this new interdisciplinary field. Mateas said this distinguishes UCSC from most other schools that offer degrees in computer game design. "There is a growing number of programs in which students learn about how games are made today. At UCSC, students are taught by people who are inventing the future of games and computational media. We present the cutting edge in the classroom," he said. The MacArthur Foundation Chair at UCSC is one of seven chairs funded by a UC systemwide endowment from the John D. and Catherine T. MacArthur Foundation. The UCSC chair will rotate to another campus after the five-year term.